Pastor thrown off motorbike, accused of illicit relationship. HYDERABAD, India, November 19, 2018 (Morning Star News) – Villagers hostile toward Christians in northern India falsely accused a pastor of an illicit relationship with a woman and, in another village, burned a church building, sources said. As people throughout the country on Nov. 7 prepared to celebrate Diwali, the Hindu festival of lights, neighbors alerted pastor Satpal Masih that his Pentecostal church building in Giddi village, Gurdaspur District in Punjab state, was ablaze. The pastor dismissed the notion that the church building caught fire from a festival accident, saying Diwali begins well after 8 p.m., and he rushed to the burning building at 6 p.m. 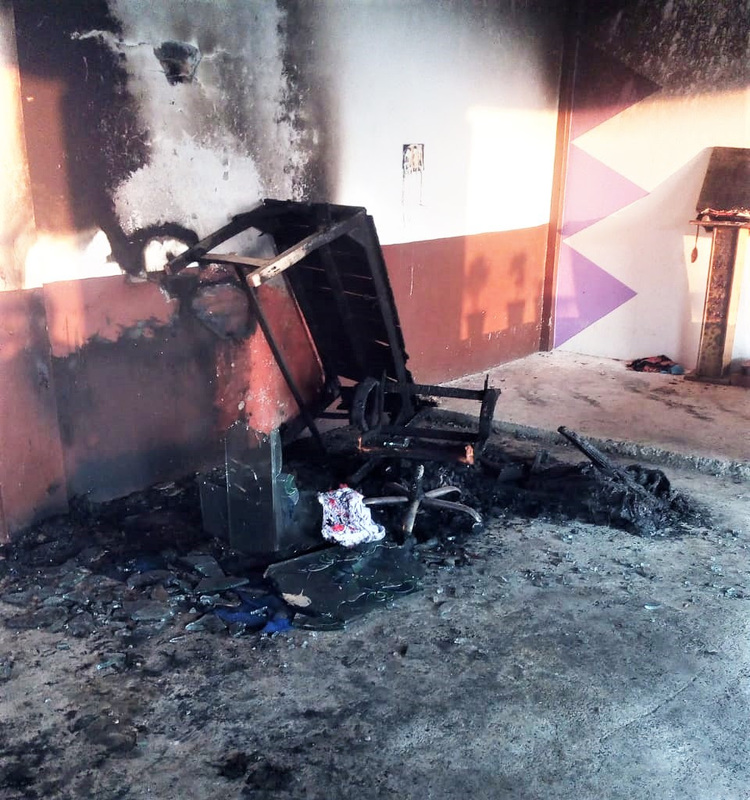 He said the fire seemed to have been set on Diwali to look like a fireworks accident, but that there was no evidence of any such explosives and no loud noises until plastic chairs and equipment inside caught fire. “In fact, it was a massive fire, and the simple festive fireworks can’t cause that great damage,” he said. Police requested 48 hours to examine the site before any church clean-up, he said, but the Christians have not heard back from officers. They cleaned up the charred remains so the damaged structure could be used for worship. “We met the higher officials, and I informed them about the increasing opposition to Christian prayers in Gurdaspur District and urged them to conduct a fair investigation,” Pastor Masih said. He knows of at least four cases of violence against Christians in Gurdaspur in the past few months, he said. “Putting aside our concerns of what happened and who did it, it is vital [to understand] that such acts are done to hurt the emotions of Christians and hinder the spread of the gospel in Punjab,” he said. Plastic chairs and mats turned to ashes, he said. The fire destroyed an estimated 52,000 rupees (US$725) in equipment and other items, but he and others were able to douse it before it reached a room where musical instruments and electronic equipment were stored, he said. After obtaining land for the site in 2012, the congregation of 300 people including children had recently funded and built the worship hall, he said. The pastor and his wife, both converts from Sikhism, had decided to share the gospel among Sikhs in Gurdaspur District after graduating from a Bible college in Ludhiana District in 2007. Sikhhism originated in the monistic teachings of Guru Nanak, of Punjab, at the end of the 15thcentury. Also in Gurdasur District, hard-line Sikhs on Oct. 31 attacked a pastor in Chaksharif village and accused the married father of two of having an illicit relationship with a woman. The pastor, also named Satpal Masih, was riding his motorbike to a nearby ATM to withdraw funds to pay workers hired to construct his church building when a gang of Sikhs attacked him, he said. He suffered a tear in his shoulder, injuries to his leg and back, and he was hospitalized for nine days. The 42-year-old pastor has been in leadership for more than a decade, and the entire village knows him, his wife and their integrity, he said. “My heart was deeply troubled; those allegations are totally false,” he said. His brother, Yakub Masih, said the pastor’s wife constantly accompanies him in his pastoral work and meetings, such that an affair would be impossible. Opposition increased when the church constructed its building, Tarsem Singh, a Christian from Chaksharif who now resides in France, told Morning Star News. The assailants took pastor Masih to the police station, where officers demanded 15,000 rupees (US$208) for his release. He did not have the money, and they released him at about 10 p.m.
After discussions with family members and other Christians, he decided to ask police to register a case and investigate, saying the allegations assassinate his character. Yakub Masih said the village council investigated the accusation and found him blameless. Police informed the Sikhs that they could be charged based on the pastor’s complaint, and on Nov. 7 Sikhs from Chaksharif and four surrounding villages visited the pastor in the hospital and apologized, Yakub Masih said. “The next morning was a working day, and police had no other option but to lodge cases, but as they had apologized, my brother said, ‘The Lord has taught us forgiveness’ and that he can’t pursue a case against them,” he said. Since his discharge from the hospital in Gurdaspur on Nov. 9, Pastor Masih has been bed-ridden and under medication. In neighboring Himachal Pradesh state, police on Nov. 3 summoned Pastor Rajinder Singh of Solan District after a former member of the church filed a complaint of forcible conversions. At the police station in Baddi, the inspector told him that Vishwanath Singh had complained that the pastor had forcefully converted his wife, and that now she wanted to forcefully convert him, Pastor Singh told Morning Star News. Vishwanath Singh, an immigrant from Nepal, first visited the church in Baddi with his wife and child in 2015, the pastor said. The family then attended church services regularly, but later Vishwanath Singh stopped coming while his wife and child continued, he said. Baddi police booked Pastor Singh, his wife and the female church member on non-bailable charges of deliberate and malicious acts intended to outrage religious feelings (Section 295-A of the Indian Penal Code) and promoting enmity between different groups on grounds of religion (Section 153-A). He requested prayer for anticipatory bail. Alliance Defending Freedom, which undertakes legal advocacy for religious freedom in several countries, notes in its campaign celebrating the 70th anniversary of the U.N. Universal Declaration of Human Rights that such abuses are taking place in a country that has a long tradition and legal framework of freedom of religion. Article 18 of the U.N. declaration asserts that believers have the freedom to practice their faith “in teaching, practice, worship and observance,” ADF notes in its campaign to obtain signatures supporting the Geneva Statement on Human Rights at www.ImHumanRight.org.